freedom might be – joy. This entry was posted in A Wounded Heart, Beauty, Characterizations, Freedom, Growth, Healing, Hope, Living in the Light, Nature, Poetry, Self Awareness and tagged blindness, free verse poem, growth, joy, light, photography, poem, self discovery. What a beautiful poem and photo, Melody! Thank you! Lovely poem, and the pic is gorgeous. Oh WOW-Wonderful, Mel–this is another 5-Star fave of mine! I really got “into” the flower’s persona–so now, tell me what flower is it? This is a clematis, a climbing vine. It is smothered in purple right now – I have never seen it so perfectly lovely as t is right now. What a treat. Smothered in purple–I love the royal pomp and ceremony of it! While I’m here, I have a garden/flower question for you: are there roses that come up annually or perennially, maybe like a wild variety?? Thanks! 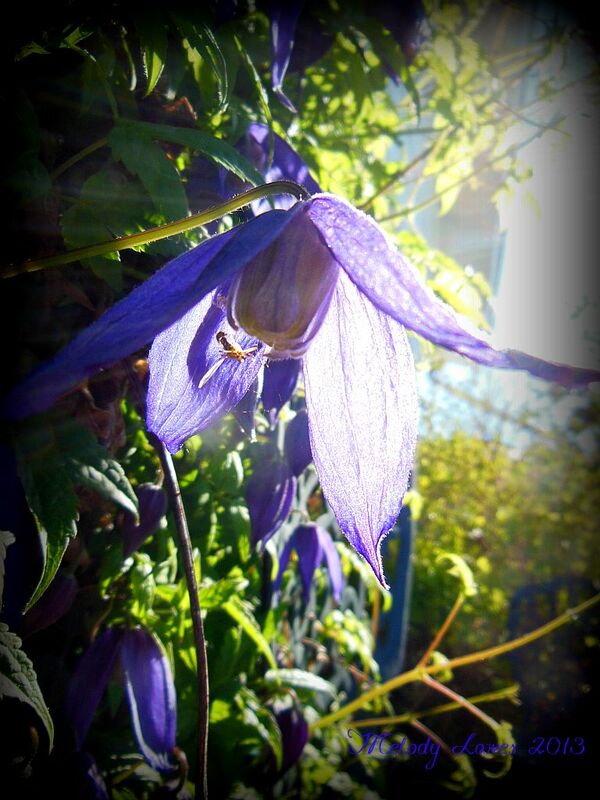 The clematis is outdoing itself this year – beautiful! !